DoubleClick Digital Marketing has always been an open platform to give marketers a more complete picture of how their digital marketing works together - across mobile and desktop, video and native. As the use of mobile devices continues to shape the consumer journey, we’re particularly focused on helping our partners make the most of in-app formats. In fact we’ve seen the volume of this type of inventory in DoubleClick Bid Manager (our programmatic buying platform) increase fivefold over the past year. Today we’re continuing this effort with a new partnership with Twitter. Through this partnership, DoubleClick clients will be able to buy Twitter’s Promoted Tweet ad format via DoubleClick Bid Manager across mobile (including in-app) and desktop. We will also make it easier for marketers to measure their Twitter ad campaigns directly within the DoubleClick platform. This deal complements our ongoing push to bring new formats and inventory to DoubleClick, like our recent announcement about YouTube’s TrueView format. We’re excited about this partnership and look forward to continuing to help our clients make the most of digital advertising in a multi-screen world. This entry was posted in DoubleClick Advertiser Blog and tagged Ads, Advertisers, Creative, DoubleClick, in-app, mobile, Programmatic, programmatic mobile, Social Media on April 28, 2015 by Yamini Gupta. 42% of brands say the #1 impact of social is increased engagement (24/7 customer interaction is a distant second at 12%). 90% of brands agree that it’s crucial to integrate social into their other digital media initiatives. 57% of companies say content shares are the most important social metric, but conversion impact is closing the gap at 54%. This entry was posted in DoubleClick Advertiser Blog and tagged Ads, Advertisers, cross-post, DoubleClick, infographic, Social Media on January 7, 2014 by Justin Huskamp. How are top brands measuring, managing and budgeting for success in social? And what strategies will the top social brands follow in 2014? Wildfire by Google, in exclusive partnership with Ad Age, recently conducted the largest survey of its kind to date, asking over 500 enterprise marketing managers and executives about their approach to social marketing. We learned what the best and most successful brands are doing to engage audiences, as well as what those that struggle with social are doing. 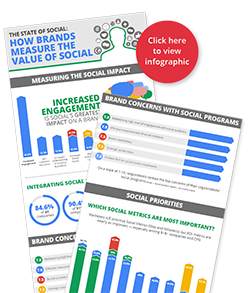 In our three-part State of Social infographic series, we’ll share with you the key learnings and top strategies you can apply in 2014. In this first infographic, we look at who is driving social strategy and who is paying for it. As social becomes more integrated into the overall digital and brand strategy, the key players are starting to change. Want to see where the influence is shifting? Just follow the money. 45% of companies with revenue over $1 billion have 50+ social employees. Marketing, PR, and Customer Experience are the top teams with a stake in social, yet social impacts up to 10 teams across the enterprise. 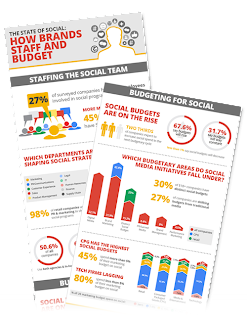 68% of companies expect to increase social spend in the next budgetary cycle, indicating that social’s role in the marketing mix is recognized and prioritized. This entry was posted in DoubleClick Advertiser Blog and tagged Ads, Advertisers, cross-post, DoubleClick, Social Media, Wildfire on December 4, 2013 by Justin Huskamp.